Due to my current backlog and less time to review products, it is taking longer for my full, thorough review style, which takes hours of comparative listening. These previews can help shed some light on amps I have for testing. Be sure to check out the source matching sections of my reviews to see how the products perform with specific headphone pairings. 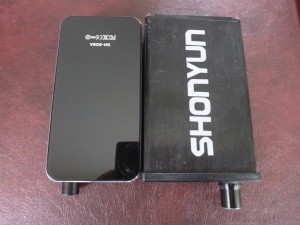 I have reviewed the Shonyun 306, but it had some issues, the biggest of which was hiss. Shonyun wasn’t content just letting things stand and wanted to improve their design and fix my issues, so the developed the 306A. The 306A has a redesigned case that is more aesthetically pleasing, however it is now prone to scratches (it does come with “screen protectors”) as it is plastic vs. metal. The volume knob is retractable, and it isn’t as wide, plus the shape is much friendlier for carrying it around. The lights are now much less obtrusive as the top of the amp lights up vs. the volume knob. So, how does it sound? As many of you know, I am constantly reviewing product and don’t listen to new gear I receive extensively until review time, but do like to listen from time to time to get a flavor and make sure everything is OK. I tried the amp with two CIEMs, which were chosen to test for hiss and channel balance. 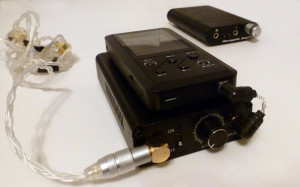 First the hiss: it is better than with the 306A than the 306, but it isn’t gone and is still very apparent with my hiss tester, the Fit Ear PS-5. There is more hiss from the 306A than from most amps I used for comparison with the exception of the MHd-Q7, Cruise, and 306. Using the Music One, which is a lower sensitivity single driver CIEM, the hiss was much more manageable and the combination was very listenable. Again, the amount of hiss fell in the same order. My initial hiss rating is a 5/10 as it is still there, but not quite as bad as the 4.5/10 that the 306 reviewed or the 4.0/10 of the Cruise. The volume control still has a channel imbalance at very low volumes, but that too is slightly improved. I didn’t test this extensively yet. What I did do was realize the 306A sounds much more musical and has much better bass weight with the Music One than the 306. I wasn’t expecting that much of a sonic improvement. Something else I noted with the 306 is that the battery no longer holds a charge. I am not sure if the 306A will have the same issue, but that is a short period of time for the battery to die. I will have to test with a multitude of headphones when the 306A comes up in my amp review queue, but until then I would recommend the amp with the Music One! The TA-1 is made by a company called Tube Amp, but this isn’t a tube amp, it is solid state. First, let me say the amp is quite large as can be seen from the picture, and even bigger than the Portaphile 627, but around half the price. Speaking of price, I had trouble finding it for sale, which may possibly because the company name is so generic, or maybe because it just isn’t widely available. Muiscaacoustics has a “pre-order” price of only $248 + $25 EMS shipping with a regular price of $295 + shipping. The images on the product page are incorrect, and additional product pics can be found here. It is well built, and relatively heavy, not to mention you would need to carry the wall charger for travel. I have paired it with many headphones in the months I have had it and can say that is performs quite well for the price. If you don’t have a high end amp such as the Lear FSM-02 V2 or the Portaphile 627 and want to save some $, the Tube Amp TA-1 will give you performance that isn’t too far off. The bass weight and control are excellent as is space and layering, and it has a warmer, euphoric sound that doesn’t lack power or musicality. While I haven’t finished a full review of the product yet, I do believe it performs well for the price range. It does make a decent desktop amp, outperforming the 2nd generation of Shonyun 301 pro (after the 627 op amp was substituted for a different op amp), which is a true desktop amp. If you have the chance, give it a listen. 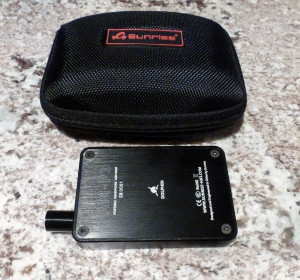 The Sunrise AM-P1 Dolphin amp is a small portable headphone amp that packs a lot of great sound into a small package at a low price of $135 + $10 shipping on eBay. First, the negatives: it uses a Mini-USB charging port, but requires a 12V wall adapter when the 8 hour battery life is over. The large, protruding volume knob doesn’t retract, and the surface will scratch over time, but the unit does come with protective covers. Are you still with me? The positives include excellent sound quality considering the price point to go with a relatively neutral sound signature. While the Dolphin doesn’t compliment every sound signature, there are some pairings that are quite impressive. There really isn’t anything lacking from the Dolphin, but it just doesn’t quite have the sense of power many of the more expensive amps convey, but dynamics and musicality are good. Of course, I still need to perform a full review, which will go much more in depth into the sound signature, strengths, and weaknesses. But for now, if you want a lower cost amp that is relatively neutral and can deal with the 12V proprietary charger (do not plug any standard USB device into it), I can say it is worth grabbing at the current price. The ADL X1 is a portable amp with integrated DAC that works with Apple and Android as well as PCs. The quality of the DAC is quite good via a computer, but when connected to my iPhone, the quality isn’t quite the same. I am not sure if the limitation is due to the iPhone or the transport within the DAC, but would most likely think the iPhone. While the DAC is good, it isn’t up to the level of the DX100 DAC, as sourcing the X1 with that DAC (and the Effect Studio Piccolino mini-mini cable), the amp really shines, showing just how good the amp section can be. It is more neutral than the ADL Cruise/Stride that I have previously reviewed. One of the issues with the Cruise is the level of hiss, and while the X1 is significantly better, there is still some slight hiss with CIEMs. Thanks for the response, yes it did help! Is adding the portaphile micro to my Ibasso x90 increase music listening enough to buy it. Hi Anthony, this question is very subjective, and only something you can answer for you. If you are in pursuit of the best sound, have improved other areas of your chain, and listen in quite, I would say yes. Not that this will help, but an example of my situation: Some days when I need to focus and crank out work for my day job (and there has been A LOT lately), I listen to the SE5U with the DX100 and the amazing realism and “musical” presentation turns something on in my head that helps with my creativity and focus. Just tonight I decided to use the Fiio X3 with the SE5U and was underwhelmed as the 3D capability and realism just wasn’t there. For me, source can make a huge difference, but then the SE5U is my “ultimate” even though I have many amazing CIEMs. On the other hand, with say a lower-end CIEM, the differences aren’t are pronounced since the CIEM is the limiting factor. In the pursuit of audio perfection, the Micro is a good step in the right direction. I hope that helps.